You really donʼt want to try playing the Apple II version. The story is reminiscent of many thick fantasy novels by the likes of Robert Jordan. Simplistically, you are a band of warriors, chosen to save the world from the ʻWrath of Nikademus.ʼ Nikademus is an evil sorcerer, and your biggest nemesis from the past two games. He hass declared war on the world, and while seemingly invincible, you must find a clever way to approach him during his weakest moment, and knock him off for good. It's a pretty standard goal for a fantasy story, but is enough to set up a fantastical journey wherein you learn new tricks, meet friends, and have a jolly good time. The beauty of this journey is the real appeal to me. Even after more than 20 years of playing, I still like to explore the world of Phantasie III. 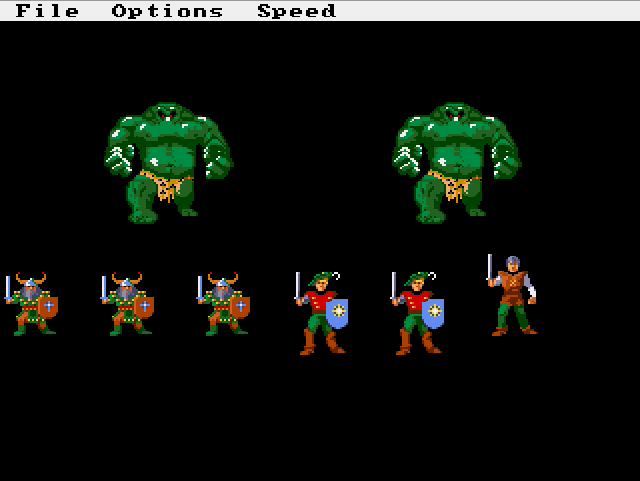 I also love Phantasie III because of its amazing graphics (this was 1987!! ), attention to detail, and simple gameplay that you can probably pick up in two seconds if youʼve ever played the Final Fantasy series (which is unrelated to Phantasie). 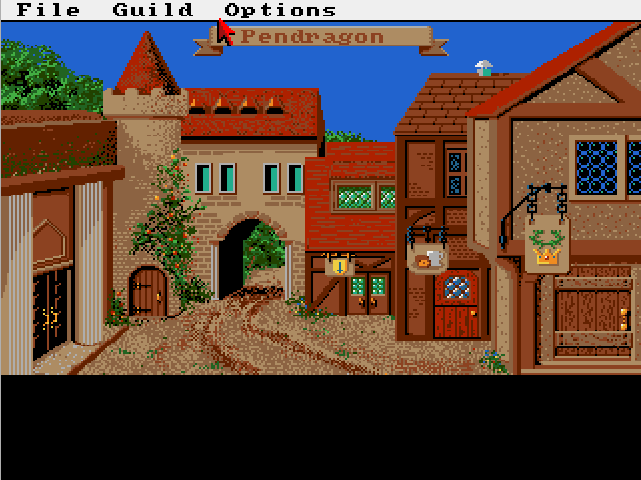 Pendragon - the town where it all starts. The beauty of Pendragon is that itʼs drawn using 32 colours, from a palette of 4096 colours. The primary display standards at the time were CGA, EGA, and VGA. CGA was 16 colours and EGA was the same, although it could choose from a larger palette. 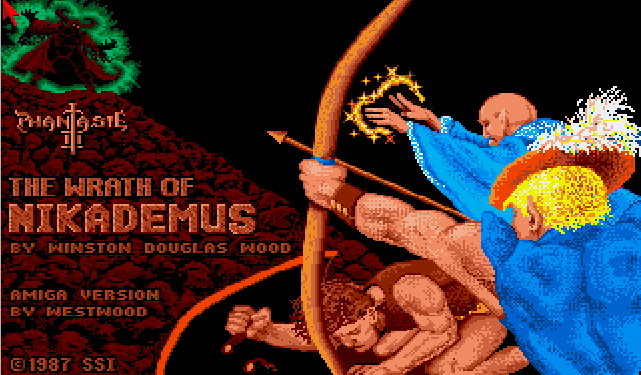 VGA was introduced just after the Amiga version of Phantasie III, but was still only displaying 16 colours on the screen, from a 256 colour palette. The Amiga blew these away with a palette of 4096 possible colours. While people were admittedly very creative with graphics around this time, itʼs great seeing a lot more shades of colours, and scenes that arenʼt all made up of the same colour (disguised by strategically positioning blending colours next to each other). With games like this, I feel there is a lot more colour and life than in other titles from this era. When I say attention to detail there are two main areas that come to mind: the story and the character stats. For me, the story was like reading a fantasy novel, and I believe that being an avid reader helps out with regard to respecting the game. Final Fantasy didnʼt cut it for me at the time because the translations (while humorous) were pretty shoddy. While the story behind Phantasie III is simple enough -- a band of peace bringers set out to defeat their nemesis -- the journey proves to be far more important that the destination. There are many vivid descriptions of locations and events that can conjure up amazing mental images. I think this is lost in a number of modern games -- replaced with stunning visuals that leave less room for imagination. I completed this game as a 5 year old, and strongly believe that such adventures gave me a good start on schooling because they forced me to read and write, while also having lots of fun. 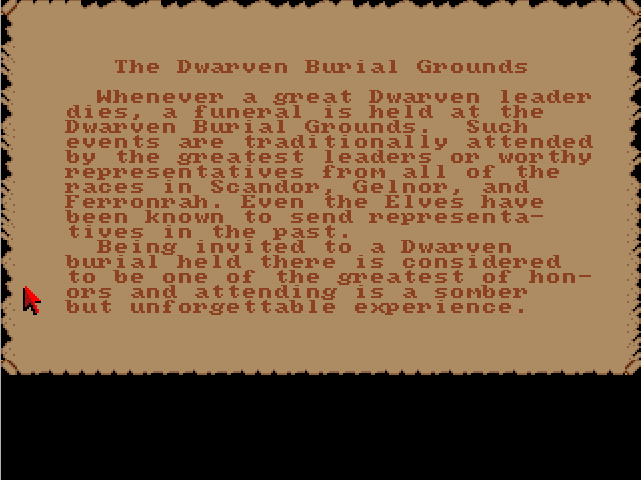 One of the many scrolls that you can read while playing. The attention to detail regarding character stats in Phantasie III is remarkable, and exposes a big hole in many modern RPGs. Take World of Warcraft, for instance: aside from your health and magic meters, all you can improve are your strength, agility, stamina, intelligence, and spirit. In Phantasie III you have 15 different attributes, which must each be trained and tweaked correctly -- otherwise the game will be impossible. Similarly, the body is divided up into 6 different parts. Now the manual says not to take this part too literally, but you can injure, break, or lose your limbs. During battle this can make for interesting tactics. Removing an enemyʼs head will always kill the enemy, as will removing all of their hit points. 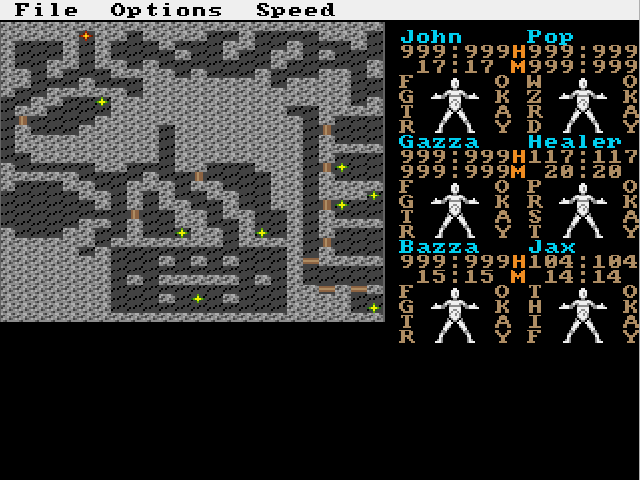 A dagger in their arm will stop them from attacking, and a broken leg will render them pretty useless. In most situations you will be hideously outnumbered, so it can be very convenient to chop enemies limbs off, to stop them from advancing. The only flaw with this system is that every enemy must have two legs, two arms, a head, and a torso; I have to chuckle a little each time I remove the killer viperʼs arms, in order to prevent it from biting me. This does conjure up some imagination, though, and it taught me not to treat things so literally. While I think that context, patience and nostalgia play big roles in the appreciation of this game, it still remains my favourite game. Itʼs not the kind that you can hack and slash your way through, and part of the fun is choosing the right party of six for the job. Iʼm still yet to decide which combination works the best, but you need a good mixture of talent to finish the game; it is often impossible to progress unless at least one party member has solid aptitude in a certain area. Half the fun is customising and tweaking your party to get through the more difficult dungeons. It may not be for everyone, due to the lack of 3D effects and the significant amount of patience/reading required, but Phantasie III is always the game I find myself returning to when I get bored. Did you play any of the Phantasie games? What's your take on the evolution of RPGs since the late 80s, or the shifting focus toward immersive 3D graphics? Let us know your thoughts in the comments below.